Whatever the final outcome of the FCC reform will be, it is interesting to speculate how the new US scenario may somehow impact on the European debate about net neutrality. In general, NN debates on both side of the Atlantic have been reciprocally linked, with the major US stakeholders massively lobbying the EU institutions (since 2006/2007, when the last European regulatory review started) with the aim to implement their NN vision in Europe and get, as a result, a favorable outcome to present back to the US, and so being able to influence the FCC. It is worth noting that the NN lobbying efforts of company like AT&T and Verizon in Europe and in the EU has been huge, considering that such companies have no residential business in the old continent and therefore should have nothing to gain there in terms of network management policies and so on. Also US OTT (Google and so on) have been lobbying in Brussels for the same reasons of US telcos (but with different scopes). However, in the last years such efforts became less visible because of the complex relationships of such operators with NN principles. European telcos have normally not made the vice-versa, i.e. lobbying in US in order to have a result to use in Brussels to influence European institutions. However, European incumbents, such as Deutsche Telekom, Telefonica and Telecom Italia, have frequently lobbied the EU institutions flagging the US deregulatory solution as the example to follow in Europe. Now that the wind has changed in Washington, both European and US incumbents will have to reconsider their tactics in front of the European institutions. Few limited NN provisions already existed in the current 2009 European regulatory framework. Successively, a more robust proposal of reform of net neutrality – welcomed by most telcos and incumbents operators – was tabled by the European Commission on September 2013 within the Connected Continent proposal. That draft is still pending but, it is worth-noting to say, the amendments tabled successively by the European Parliament and the views recently expressed by the Council have radically changed the initial scenario. The reform resulting out of the latest proposals, including the view of the Italian Presidency, seems much more close to the interests of citizens and libertarians: general and more robust non discrimination obligation; formal requirements for specialized services; guarantee for best effort Internet. Since the views flagged by Obama mainly focus on re-classification (aka regulation) of the Internet, as well as prohibition of paid prioritization, it is interesting to see how such proposal may be reflected in the European draft reform. The idea to classify Internet as a “public utility” and therefore to potentially apply telephony rules to the Internet may be disruptive in US but non in the EU. This re-classification means, in US, that networks providing Internet access may be subject to regulation in general, not only for consumers scopes (net neutrality) but also for competition reasons, so as to become available for access request by other operators. This perspective is feared by US telcos which currently enjoy a local monopoly in the last mile for Internet access (but not for telephony), since their networks are rarely competing with each others in that segment, with the result that the ordinary US consumer has normally no possibility to choose and change ISP: he/she just have to take the sole telcos and/or cable arriving to the premises. In this respect, it is interesting to see that cable company Comcast welcomed that intervention of Obama, with a sole significant exception: “There is one important technical legal difference of opinion between the President and Comcast: we do not support reclassification of broadband as a telecommunications service under Title II.” So, the problem is there. By contrast, the European 2009 framework for electronic communication services provides that all networks, irrespective whether fixed or mobile, supplying voice, data ecc, may be regulated if there is a competitive failure recognised by a national authority. This is the reason why access rules to networks such as ULL and bistream normally exist in the EU and allow a plurality of alternative operators to offer Internet and data connectivity also through some parts of the incumbent networks (the last mile). One could argue how this regulatory difference impacted on the developemnt of telecom networks in US and EU respectively. For sure, EU citizens enjoy more choice and better prices than US consumers, as recently claimed by the american press. Obama objected the possibility for US ISP to provide “fast lanes” for specific specific services in exchange of remuneration, on the assumption that this discrimination would enable telcos and ISPs to pick the winner in the Internet market. The Internet should remain neutral, meaning that information and services (not bits!) should be treated in the same way, apart from some reasonable exceptions. 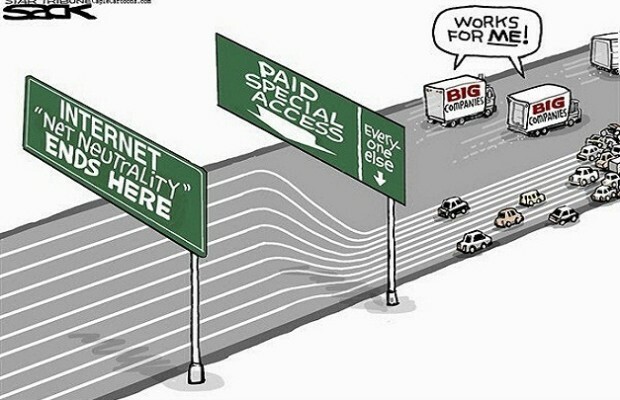 This position is fundamentally important for the US market because, in the absence of competition in the last mile and without possibility for users to change ISP, any telco could de facto, by simply deprioritizing non-agreed services, limit the offer of online services which may be selected and enjoyed by consumers. Again, the above scenario should have a more limited impact in the EU, as far as the existing competition in the Internet access, guaranteed until now by access regulation, should prevent incumbents telcos and ISP from imposing to users a basket of preselected services. Should an incumbent ISP impose selected prioritized services to its consumers, they could theoretically switch to another ISP. It is worth-noting, however, that switching ISP is not as easy and automatic as people believe, since the consolidation of certain markets – in particular mobile, where ISP are going to be reduced from 4 to 3 network operators, which tend to have aligned commercial policies – may reduce this chance for consumers. However, the threat of loosing “switching” customers is still a concern for dominant ISPs in the EU and currently it constitutes the best working remedy against non-neutral commercial practices, at least in the fixed sector, where the plurality of ISPs is more enhanced. The Connected Continent proposal mentions specialised services (i.e. the European equivalent to paid prioritization) and make them subject to specific definition and conditions, including the guarantee that best effort internet should not be affected. In other words, paid prioritization is part of the foreseeable European NN package and it is unlikely that it will disappear. More likely, guarantees for the best effort will be reinforced as a consequence of the Obama’s position. In any case, the competitive and regulated access scenario in the EU should minimize the detriment for users, unlike US. To sum up, Obama’s intervention will have a strong political impact in the European NN debate, on one side because of the historical link between US and EU when debating about NN, and on the other side because an opinion coming from such a prominent person, even if non European, cannot be ignored so easily. Left-winding national governments and left-winding parties will have to take into account of the Obame’s view, even if it not completely confirmed by the FCC at the end. The influence of the Obama’s position will operate at very high political level, while the consequences in practice may be less significant than expected, because of the different regulatory and competitive scenario in US and the EU respectively.